Come limitare comportamenti a rischio sul posto di lavoro (in ambito Salute e Sicurezza) all’interno delle comunità di immigrati nell’Unione europea? Provision of obligatory basic training (such as Health & Safety, food hygiene, child protection) is an essential part of employment law. Very many migrants are employed in workplaces which must provide this training, but a significant minority have a low (or nil) ability level in the host country language. This means that they attend compulsory training which they cannot understand, so that they are effectively untrained. This situation is dangerous, and quite possibly illegal, because the requirement for basic training is not actually being met. If an incident occurs and it is found that a migrant worker has no real training, the repercussions could be severe, in terms of liability and insurance cover. Very few industries are now homogenous in their ethnic make-up. With the development of transport technology and the increased need for immigrant labour, we now find foreigners working in industries as varied as agriculture, nursing, manufacturing, law, education, social services, catering and transport. With the numbers of different cultures interacting, communication problems naturally occur. If basic understanding is missing, risks are created and danger can appear. These risks cannot be dismissed as “only theoretical” – there are real dangers to health, and a real need to safeguard people through secure information and learning. Intercultural awareness is a necessity to ensure communication between staff and also between management and personnel. With clearer lines of intercultural communication established, companies face fewer problems and see greater productivity. Intercultural awareness is a means to establishing better relationships and promoting healthier business prospects through minimising the possibility of misunderstandings born of intercultural differences. On the organisational level, due to our globalized world, there is now an increasing need to bring together people from different cultures under the umbrella of one organisational structure. This can only be realised effectively through highlighting differences in each other’s’ interpretations of the organisation, corporate and management cultures, planning and decision making processes, leadership and team work styles. The objective is not to create a homogenous, one-dimensional workforce but to simply reduce the impact of poor communication and misunderstanding. Finally, on the societal level, for those that deal with the public in multi-cultural societies, knowledge of different ethnicities, religions and cultures is important in breaking down barriers. Staff working in sectors such as the police force, prisons, healthcare, and other public services need intercultural training in order to be aware of who their clients are and how to deal with them sensitively. The CLARITY project tackled these requirements. 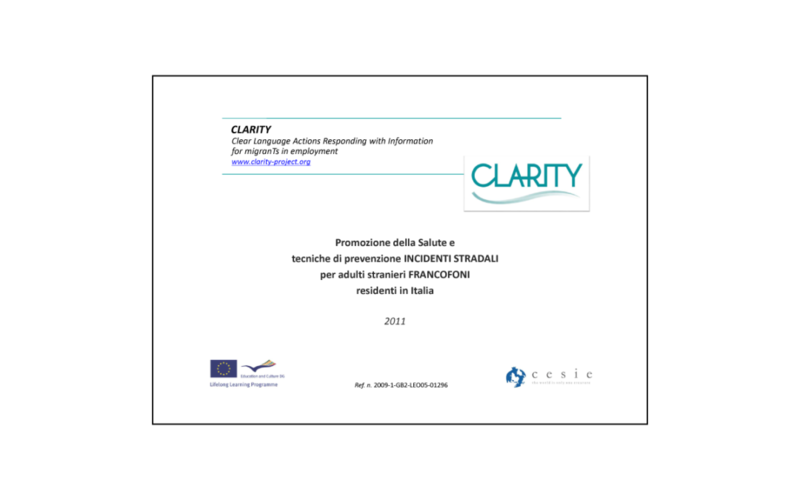 The desk-based research on the need for Clarity training in a specific employment sector investigated the options for the achievement of registered trainer status by migrants, aiming to understand the legal and regulatory structure (eg restrictions of non-EU citizens) so to identify and document the requirements for trainers in general (qualifications, registration with professional bodies, attendance on accredited training) and research the opportunities for migrants to use Accreditation of Prior Learning to satisfy part or all of the qualification process as a trainer in Europe. The study led to finally train a small number of migrants to become trainers in their own languages about an employment sector, translate existing training courses into the migrant languages and the final peer-to-peer delivery own-language basic training in more languages and more workplaces for the their minority community members. We believe that there is a clear need for a training structure which permits basic, initial training, in the workplace, to be delivered in migrant languages. This is absolutely NOT a call to stop teaching the host-country language – which remains vital for reasons of integration, professional development and efficient working. Migrants from the same language group have 100% understanding of the language. In addition, they have another vitally important ability: they are aware of the cultural / educational / social differences between their home country and their new host country. We realised that migrants do not only need a simple translation of the basic training – they also need a trainer who can understand and explain the cultural differences. This is essential, if newly arrived migrant workers are to achieve a fast understanding of the workplace. The need for own-language training for migrants, and the current situation in our countries. The main problem is communication (cultural and professional) in workplaces, for migrants who have not yet learned the host-country language. 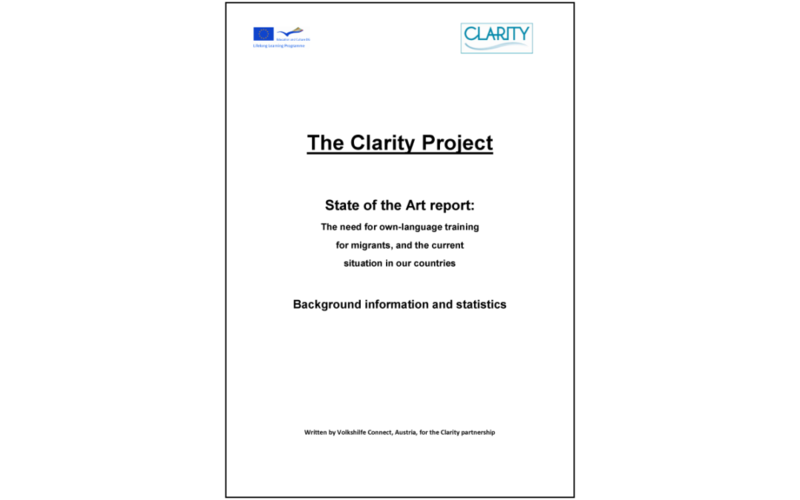 We have created an analysis/learning/translation structure, the Clarity Training Course. This innovative new resource permits the creation of new basic training in a new language, based on the existing requirement in the host country. The Handbook provides information about the main challenges, the products developed by the partner group, information about the Clarity “Train the Trainer” concept, practical activities and some Case Studies and other material to illustrate how the process works. Why focusing on road safety? Obtaining a drive license means not only greater autonomy but also more chances to find a good job. Furthermore, every year the number of foreign citizens involved in deathly road accidents, or at least very serious, amounts more or less to 20% of the total number, with peaks reaching 25%. Considering that nowadays the immigrants living in our country, on a regular basis or not, are approximately 10% of the total population, the number of immigrants involved in road accidents is at least twice the number of Italian citizens involved in the same.